Q. Who should read this book? A. This book is for financial advisors, investment managers, wealth managers, financial planners, and the vendors and other professionals who support them. Why? Because it will help them grow their companies. Blogging has become a “must” for many of these professionals. It’s a great way to build your business by connecting with current and potential clients as well as referral sources. Blogging attracts prospects to your website, media attention, and speaking engagements. It also cements your reputation as a leader in your field. Savvy investment managers, wealth managers, and other financial professionals know blogs are an excellent way to communicate topical information before it gets stale. This deepens your relationships with current clients. 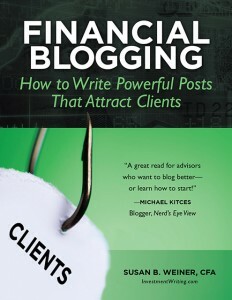 But many advisors struggle to create a steady flow of compelling blog posts. This isn’t surprising. After all, your professional training focused on helping clients manage their investments or finances. You may have never taken a writing class or written for publication. Don’t worry! Help has arrived. A. I wrote this book because I know how you feel when you stare at a blank page. I couldn’t get anything right after I started as a staff reporter for a weekly mutual fund newsletter back in the mid-1990s. I struggled to generate story proposals that would win my editor’s approval. Even when my ideas made the cut, they failed to push my readers’ hot buttons. Plus, my editor had to make too many stylistic edits to my writing. It was so frustrating. Luckily, I had the opportunity to improve my writing—and to learn how to teach you how to write more effectively. Q. What will people learn? It also addresses time management, compliance, and marketing challenges. Work through this book and you’ll be ready to launch your successful blog. Already writing a blog? You can refine your techniques, so you improve the return on investment (ROI) from blogging. Every financial professional likes a higher ROI.